Ray Lewis had reached a point in his life where he felt like he wasn’t moving forward. He felt stagnant in his professional life, and also felt some distance forming between him and his wife. He had gotten to the point where nothing seemed to matter – he was feeling stuck in life. Ray’s wife noticed something was wrong and she encouraged him to work with a Results Coach. Although Ray was reluctant to the idea, after meeting with his coach for an introductory session, Ray knew coaching was a game-changer. Ray’s coach let him know that he was in a judgment-free zone, and while he might not always be Ray’s best friend, he would push him towards his goals hold him accountable for his progress. Then they got started – Ray told his coach everything. Soon enough, Ray also felt motivated enough to get back into his passion: Running. Without even trying to focus on health at the start, it just came naturally. As he worked with his coach to breakthrough barriers and stop feeling stuck in other areas of hid life, physical fitness seemed more appealing. Ray’s marriage also began to feel more natural. He got his wife into coaching as well, and the pair was able to develop better communication habits and foster a renewed sense of intimacy after nearly 25 years together. A Results Coach worked with Ray to identify what he really wanted out of life. After hearing Ray say “I feel stuck,” his coach was able to work with him to identify the limiting beliefs and habits that were holding him back. Ray’s now been working with his coach for over a year, and he couldn’t be happier with the results. The process that initially sounded intimidating is now one of the most productive relationships in his life. Ray was able to share some of his deepest thoughts and worries with his coach. Once he realized that he wasn’t a bad person, he was just dealing with damaging, limiting beliefs, Ray was able to move forward and reach the next level of success in all areas of his life. A major breakthrough Ray experienced was accepting that he would never be perfect. Ray’s coach helped him to change his internal dialogue, to let go of the need for perfection and instead strive to enjoy each day and find joy in all the little moments he was overlooking. “All those problems and all those failures made me into who I am,” said Ray. This new mindset has enabled him to be more successful in his business, health and marriage. This small shift in his way of thinking has opened up a new world for Ray. Ray’s customers noticed he was calmer, more productive and happier to be around – he’s seen a high number of repeat customers that he didn’t have before. Ray’s describes himself as being “intense” with his family before working with a coach. Now, he’s able to be silly with his children, appreciating life to the fullest and making the most of their time together. For Ray, the most astounding thing has been that his daughters are now wanting to spend more time with him, and opening up to him more about their lives. As Ray worked with his coach he’s felt every aspect of his life change for the better. He says he now feels more masculine, happy and confident, and this sense of empowerment has deepened his relationships and helped his business to reach a new level of success. Not only does Ray no longer feel stuck, but he feels that he no longer has to constantly chase perfection. By knocking down his limiting beliefs and developing joyful, sustainable habits, he’s found a new sense of happiness. He can enjoy the life he’s built for himself and his family without feeling angry or anxious. Instead of trying to go it alone and letting the pressure build up on him, Ray now understands it’s OK to lean on others, like his Results Coach, for help. “I realized, a lone wolf dies… because a wolf can’t survive without the pack. That’s why I told my coach, ‘I will be with you as long as we’re both doing it.’ He’ll keep pushing me and making me uncomfortable, but he’s another member of the wolf pack,” said Ray. Have you ever felt stuck in life? Could you have limiting beliefs that are holding you back? 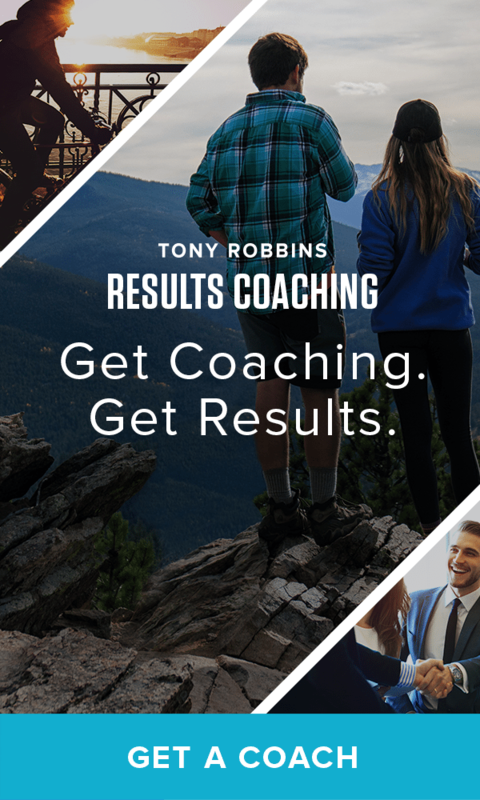 It could be time to work with a Tony Robbins Results Coach and discover the next level of success in your life. Book your complimentary introductory session today and start working today to create your extraordinary life.